What is the main purpose of the black Christian church? You might think that its purpose is learning about and worshiping God and Jesus Christ. That is, after all, the purpose of Christianity, isn’t it? Like white Christian churches, the black church is not monolithic; all black churches are not the same. There are Baptist churches, Church of God churches, and other denominations within the “black church,” just like there are in white Christian churches. And, just like white churches do not all “operate” the same way, neither do all black churches “operate” the same way. However, understanding that there are some differences in the fine details of how various churches do things, most people will acknowledge that God and Jesus are the same, regardless of the color of your skin, and there are not different requirements for what God and Jesus expect from their flock depending upon skin color. So, why are there such differences in the way they behave? Why should white Christians and black Christians worship differently? Why are church services dramatically different in Jeremiah Wright’s church than in the white Baptist, Methodist, Catholic, or other Christian church down the street? The answer is that black churches—some of them, at least—are not just places to worship God and Jesus, they are places where politics is alive and thriving, places where politics plays a large part in services and sermons. Jeremiah Wright’s church is one of those. Wright is the just-retired pastor at Trinity United Church of Christ, the church where Democrat presidential hopeful Barack Obama belongs, in case you didn’t know. At Trinity, in addition to learning about God and Jesus the congregation also gets a strong dose of Jeremiah Wrights’ black politics. There, Wright has a somewhat captive audience for his political extremism, anti-white and anti-America tirades. Among those in that audience are children as young as Barack and Michelle Obama’s young girls who were born in 1999 and 2001. And over a period of several years, they may well come to believe as Wright does, as Michelle Obama apparently did. Jeremiah Wright spewed divisiveness and poisonous rhetoric about his country—their country— to his congregation from that Christian pulpit with the authority of a trusted and respected figure in their lives. He spewed anti-white rhetoric and anti-America rhetoric from that Christian pulpit. He spewed absurd conspiracy theories from that Christian pulpit. Is there ever justification for that? Is any of that a legitimate part of Christian theology? And, is that the way to close the racial divide that persists in America, or does that perpetuate or widen that divide? At first I tried to give Wright the benefit of the doubt when he spit out his anti-white and anti-America rants. I accepted the assertion that we heard only pieces of sermons, and that he preached in that church for more than twenty years and those rants were not representative either of complete sermons or of most of his sermons. Wright removed the hesitation I had in believing the harsh accusations against him when he addressed the National Press Club and revealed himself to be an egotistical defender of his foul rhetoric, putting his own interests above the interests of his congregant, the first black man ever to have a realistic chance at being elected President of the United States. The picture that emerges from Wright’s behavior in the pulpit and his performance at the National Press Club is a picture of a man who inflames racial feelings in his congregation, and whose motive is to persuade them not to be part of the existing culture, but to resist becoming part of that culture and instead to insist that the existing culture adapt to their preferences. Is this the essence of the black liberation theology that Wright subscribes to? Is this philosophy held by all members of Trinity Church? Watching the congregants shouting, clapping, cheering and jumping up and down to those portions of Wright’s sermons filled with anger and idiotic conspiracy theories leaves the clear impression that most do. All of which begs the question: Does Barack Obama believe all of Wright’s poisonous ideas, or some of them? You can see the evidence in Michelle Obama’s public statements that she at least partially subscribes to them. And while Barack Obama has been more thoughtful and more careful to not make inflammatory statements like his wife, you can see evidence of his own acceptance of the black liberation theology that Wright professes in the ideas he has expressed. Until a day or two ago he defended Wright and his tirades, and only when Wright’s comments at the National Press Club made an already bad situation worse and obvious to all that it was taking a toll on his candidacy did Obama denounce Wright’s inflammatory ideas. Blacks Americans are a minority, and a small minority, at that. They comprise just 12.1 percent of the population of this country which, interestingly, is slightly less than Hispanics, who are 12.5 percent of the population. Non-Hispanic white Americans comprise 69 percent of the population, and like it or not, a majority of that magnitude determines the characteristics of their culture. What Wright preaches is that by refusing to adopt the predominant culture as determined by seven of ten Americans, and instead defiantly clamoring for the majority to accede to the wishes of one of ten Americans, blacks can somehow change the way the majority thinks and wants to live. But all the Jeremiah Wrights in the world can’t overcome a seven-to-one majority, and the harder they try, and the more adamant and militant they are in trying, the longer it will take for them to be fully accepted, and the farther outside the norm they will be. 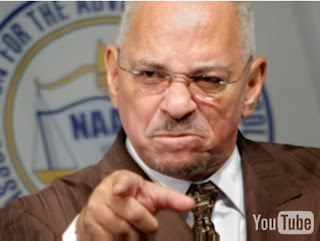 Jeremiah Wright and his foolish ideals are doing grave damage to black Americans, holding them back, and perpetuating the very circumstances that he so loudly and profanely decries.